We have been reading for quite a while now how Android has surpassed iPhone and taken the number one spot in terms of smartphone shipments. I don’t dispute that number. What I do dispute is whether it really says anything that matters. As I kept hearing more and more about “Android’s Dominance” I was seeing quite the opposite in the real-world. I operate and assist clients with a number of sites and, as a result, I have visibility into tracking data for many sites. What that information showed, in spot samples, was overwhelming iOS dominance and, in particular, iPhone dominance. It was glaring. Something didn’t add up. I was also seeing a staggering shift away from desktop/laptop computers (Windows and Mac) to mobile devices, particularly over the past six months. So I decided to look at the data more closely to see if I could find any indications of this supposed “Android Dominance” and to see how real this apparent shift to mobile is. Below I present two info-graphics. Both are “how people accessed the web.” The first is from early 2010 and the other is basically now, very current data (the first 10 weeks or so of 2012). How People Access The Web 2010 - © Copyright telEvolution, Inc.
How People Access The Web 2012 - © Copyright telEvolution, Inc. I first put together the 2012 chart. Once I had that in hand, in this visual form, I found myself compelled to look back to how much things had changed. So I put together the 2010 chart, thinking 2010 is not that long ago. The iPad was out at that time. iPhone had been out for two years. To say I was surprised by the shift from 2010 to 2012 would be a colossal understatement. In terms of the 2012 picture, when you see it this way, the so-called dominance of Android is put in more realistic perspective. Also obvious is the Android fragmentation. At the same time it shows, rather dramatically, just how dominant Apple is in the overall mobile space and, in particular, iPhone. That iPhone pie slice in the 2012 info-graphic is just staggering, visually. Almost as dramatic, visually, is the fragmentation of the Android segment. 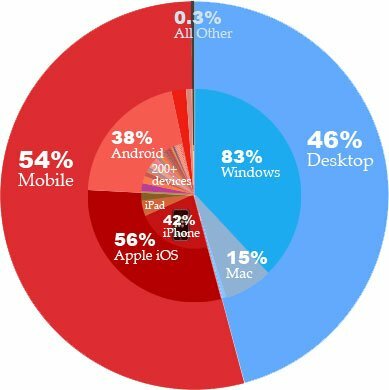 And that 42% figure is not just 42% of iOS but actually 42% of the entire mobile space! Nothing else comes even close to that dominance. People may well be buying Android devices, but they are clearly using their iPhones. If you’re wondering, the 0.3% “All Other” segment is things like game consoles, Playstation, Wii, Google TV, connected TVs etc. The only reason that even gets a label is because I was surprised how small that segment was. People watch Netflix on those boxes, but they apparently don’t use them to surf the web very much. It’s also kind of interesting, but probably not all that meaningful, that the Mac pie stayed about the same size overall between 2010 and 2012, about 7%-8% of the total. The dramatic desktop decrease is in the Windows segment, dropping from about 87% of all accesses in 2010 to just 38% in 2012. Another side note is how, even in the much larger 2012 mobile pie, Blackberry, Nokia, and Windows Phone, which may have actually grown in terms of raw numbers over this period, are still so visually insignificant that they don’t even get a label in the chart. 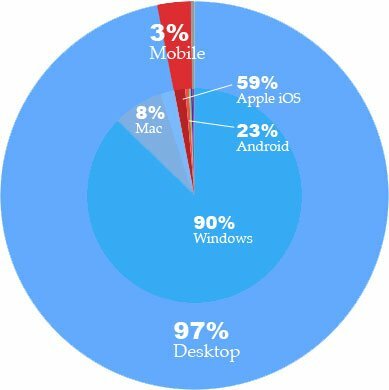 Far beyond the real Android story, Google has to be worried even more about the decline in the desktop pie, given that according to their own SEC filings, 96% of their revenue comes from web browser clicks – and people aren’t clicking those ads on their mobile devices. Google’s entire revenue model falls apart on mobile and so far, they’ve had no answer for that. Perhaps this is one reason they are shifting gears so much toward Google+ which seems to me to be chasing a 2002 dream. I’ll stand by this dataset as a good representation of the net at large, although it is slanted toward the English speaking net. This is the aggregate of a number of popular and general sites. If you look at one focused niche site, it might vary a bit from the above, depending on how narrow the site is, but if you look at enough varied sites, I’m certain you’ll find something that looks a lot like the above. The take-away for me is that not only are we headed into a mobile future, but we are headed, for better or worse, into an Apple future, and we better get used to it. If you take the Mac and iOS combined, Apple now owns 45% of the surfing experience, already surpassing Microsoft Windows at 38% – and it’s only getting worse for Windows, as iPad sales continue to steamroll PCs. This “Android Dominance” meme is utter fiction and wishful thinking. Windows Phone? Get real. Unless you’re fine playing in a niche space, if you’re building a product or service and it isn’t designed with mobile first, it’s time to re-think it – throw out your plans and start over. I’m dead serious. What’s more, if it doesn’t thrive in an Apple-dominated mobile ecosystem, it’s also time to go back to the drawing board. Meta: If you use these graphics, please give credit. I remember Sun often reminding us of the import of a billion J2ME devices extant worldwide. While Android is infinitely better than J2ME, both technically and in practice, the resemblance is more than passing. It doesn’t matter how many of your devices are out in the wild. What matters is that your average consumer can actually use it. And that they can talk about how they use it with their friends – friends of any stripe, whether technically savvy or not. You get that with Apple products. With Android, Droid, or whatever, you don’t. Hey David, great post, and long time no hear, I think it goes back to the VON days we last saw each other. Really good data and thoughts above. I was thinking it would be interesting to break out iPhone by type, one of the mobile companies I work with does have to customize their app for different iPhone hardware types and OS rev levels (i.e. there’s not just one iPhone, more like 4 – 6), ditto with iPad. So there’s a small bit of fragmentation even in the iWorld. Also fyi, I’m not seeing anywhere near the skew to mobile browser access on sites that I’m involved with. I’m seeing more in the 10 – 15% range. But these are small traffic sites, something like 5000 uniques per month. (I no longer have data to the big Lavalife traffic patterns). I suspect the type of site affects the traffic, certain sites are more likely to draw mobile clicks. The conclusion about the trend to mobile though is valid, it’s just the speed of transition, and I think you’re spot on with the threat to google’s search revenue. Anyway, nice to drop in here and hope to see you around again at some industry event someday. I want to send people to this article, yet I can’t without a bit more information. What is the data source for the graphs? How were the numbers derived? Hi Steve, nice to hear from you as well. Thanks for commenting. Yes there is some fragmentation in the iWorld too, but certainly a lot less, not only because there are fewer different devices, but also because users tend to update to the latest revs more consistently. Although, this can still be a challenge for developers (as you know), it is nowhere near the same problem of Android. I explicitly excluded sites that were mobile focused or mobile-only sites from the data. In fact, the sites used are not even particularly optimized for mobile browsers. But they are general sites, not just appealing to a particular set of tech. users. I would say that sites with more visual content, more emotive content, tend to attract mobile users more than text-laden sites. @Mac Boy: I can’t name the sites for confidentiality reasons. The numbers were derived from accesses, so collected directly on the servers. Numbers from several different sites were merged together to form the aggregate totals. As someone else noted, this is based on “unique visits” and not “duration on site” which may still favor PCs. I actually have not looked closely at that, but I might. It’s a little harder to put together. A quick look at that data suggests it’s not as different as one might expect and perhaps PCs don’t dominate that number either, i.e. that people actually spend a fair bit of time on these mobile visits and they are not just short duration “drive-bys”.